The main goal of e-bikes is to positively affect your life. Enjoy fresh air and benefit from physical activity while you accomplish all the running around of your daily life. Now you can easily conquer steep uphills, and no longer feel the resistance of the headwind. All thanks to the assisting power of the engine. Generally, in a big city, you'll get to your place of destination faster by e-bike than by bus. Additionally, you no longer need to adjust to a schedule of public transport. 250W motor accelerates the bike to 25 km/h, and the maximum speed depends on the cyclist himself. One charge of the battery is enough for up to 50 km. Enjoy longer trips to picturesque places. You will spend 80 times less money on fuel if you use an electric bike instead of a car. 1kWh of electricity costs EUR 0,17 and this will be enough for three full charges of the battery. That is equal to 120 km. The same distance by car (8 l/100 km) will cost EUR 14. The difference: for 14 euros you can charge your electric bike 250 times and drive 10,000 km. Health research counts the use of pedelecs (i.e. those electric bikes that assist while pedaling) as ‘moderate’ exercise. It is recommended that adults should aim to achieve at least 30 minutes of moderate intensity activity on five or more days of the week. Since e-bike ride is much more comfortable and pleasant, you can spend more time for a trip than when jogging or riding an ordinary bike. By spending more time exercising and driving greater distances, you burn more calories. Cardio exercises (including riding an electric bicycle) are an excellent way to lose weight and maintain a good shape. In a case of moderate physical activities, fats are used as a primary source of energy. On the contrary, intense exercises (anaerobic) use carbohydrates in energy production, which does not contribute to reasonable weight loss. Therefore, more time-consuming moderate exercises are the key to proper weight loss. A 2008 Dutch study involving 1448 respondents concluded that respondents owning electric bicycles cycled further, faster and more frequently than other respondents. 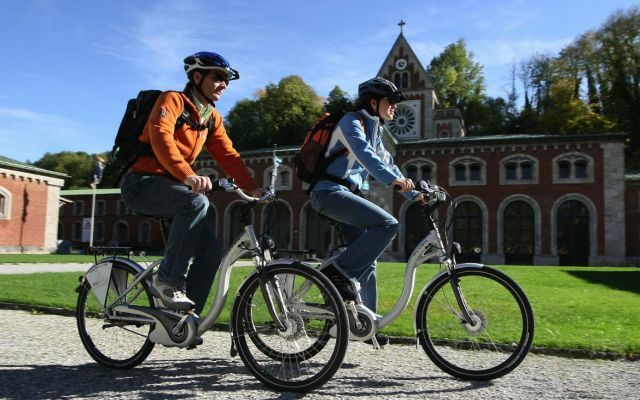 If your work, housekeeping and leisure activities take away most of your day and you simply do not have enough time to maintain your health and fitness, you can easily integrate e-bike trips into your daily life. Ride an e-bike to work, if it is possible. 5 km of the journey will take only 15 minutes. Additionally, you will arrive fresh and energized without breaking a sweat. Only for pedelec e-bikes, more powerful models require insurance, read more here.